What if we said… it’s a spaceship? Artist’s impression via European Southern Observatory on Flickr. Loser: Foxconn. The company was all in for its generous benefactor Scott Walker, announcing three suspicious satellite innovation centers in Milwaukee, Eau Claire and Green Bay, in order to convince voters their massive $4.1 billion subsidy would benefit the whole state, but polls show it didn’t work. Now they will face a Democratically-appointed DNR secretary, who may have different ideas about how much air and water pollution — and how much withdrawal of Lake Michigan water — is allowed. This is going to be one to keep an eye on. In other news, Wisconsin approved marijuana use, so that’s an alternative use for those fields, perhaps. Google today announced that it will be adding native support for “foldables” into Android. These are devices with foldable displays, the first of which will come from companies like LG and Samsung. The way it works is that when devices are folded, they look like regular smartphones, but when you open them up, there’s a larger screen. The idea is to seamlessly transfer the contents of the smaller screen onto the larger one. The good news is that most Android apps are already optimized for different screen sizes, resolutions, and aspect ratios. After all, Android is a very diverse ecosystem that ranges from low-end phones with low screen resolutions to flagship phones that are QHD. There are aspect ratios from 4:3 to 19.5:9, and screen sizes that go from a few inches to the size of a desktop PC. But native support is something that’s meant to prevent fragmentation. If this doesn’t happen, then OEMs will have to create their own implementations, which could result in different experiences across the board. We’ve seen this before, with fingerprint sensors and screen notches, both of which started appearing before there was native support in the OS. Pokemon GO has once again seen a relatively successful month, though it’s coming down slightly after a summer surge. Niantic’s location-based AR adventure brought in $73m in revenue for October, a 67% year-over-year increase. This is still a bit of a dip from the game’s summer high, but given the game is in many regards a seasonal one, the slight drop is unsurprising and in line with what Niantic has seen in past years as the weather grows colder. What’s more interesting about the numbers from Sensor Tower is both that the game seems to be doing better this year than last, cold weather aside, and that it also narrowly edged out Fortnite (on mobile) for total revenue last month. You’d forgotten all about Pokemon Go, hadn’t you. Good in-depth article about Deliveroo; and cyclists have repeatedly proven to be faster through cities than any other form of transport. In October of last year, a mysterious, cigar-shaped interstellar object fell through our solar system at an extraordinary speed. 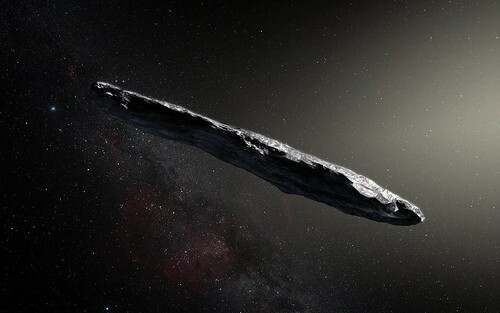 When the Pan-STARRS 1 telescope in Hawaii first discovered “Oumuamua” — the object’s official nickname, meaning “a messenger who reaches out from the distant past” in Hawaiian — researchers assumed that it was an ordinary comet or asteroid. But the longer they observed Oumuamua, the more improbable that hypothesis appeared: After all, what kind of asteroid is ten times longer than it is wide, and suddenly accelerates in speed, for no discernible astrophysical reason? A new paper from scientists at the Harvard-Smithsonian Center for Astrophysics offers an answer: the kind of asteroid that is actually a solar-powered component of an alien spacecraft that broke off its mothership while investigating Earth’s solar system. Specifically, the paper postulates that Oumuamua is a “solar sail” — an object that propels itself through space by channeling solar energy, which is a technology that intelligent life-forms (such as they are) on Earth have already developed. This hypothesis would explain why Oumuamua suddenly accelerated while traveling through our solar system. You look at it and you think: actually, could be. Though plenty of scientists really don’t think so. Councillors should be looking at the overall effect of the network, not just the individual kiosks. There’s one intriguing bit of context for all of this that Apple won’t acknowledge in its discussions with Ars or anyone else: Macs are still on Intel chips. It’s obvious to those who follow the company closely why that status quo isn’t providing what Apple needs to move forward in its strategies. Further, a Bloomberg report citing sources close to the company claimed that Apple plans to launch a Mac with custom silicon—and we’re talking CPU here, not just the T2 chip—are in the works. Apple has come to dominate in mobile SoCs. In a lot of ways, though, Qualcomm has been an easy dragon to slay. Should Apple choose to go custom silicon route on the Mac platform, Intel will not be quite as easy to beat. But the rapid iteration that has led to the iPad Pro’s A12X makes a compelling case that it’s possible. Apple won’t talk about its future plans, of course. You could say that’s all in the future, but when you have a 7nm tablet chip that rivals the CPU and graphics performance of most laptops and beats two out of five of the modern gaming consoles on the market with no fan at barely over a pound and less than a quarter-inch thick… it feels a bit like at least some particular future is now. Now, if only there were iOS versions of Final Cut, Xcode, and Logic. Axon also brings up one other point: Apple has implemented machine learning chips in its phones and, now, tablets. When are they going to come to the Mac? What particular role would they play there? Do they need ARM Macs? You’d have to think that it would be a whole lot easier to implement on a desktop than a phone. Spin was one of the three companies that initially deployed its scooters in San Francisco back in March. Along with Bird and Lime, Spin was forced to remove its electric scooters from the city until the city determined a permitting process. Since failing to receive a permit to operate, Spin has been one of the more quiet scooter startups in the industry. Though, next week, Spin is meeting with the city of San Francisco to appeal the denial of its permit to operate electric scooters in the city. As of June, Spin had a contract with electric scooter manufacturer Ninebot, owned by Segway, to purchase 30,000 scooters a month through the end of this year, according to a source. It’s not completely clear why Ford feels the need to acquire Spin — let alone any electric scooter company — instead of just forming partnerships with scooter manufacturers to launch its own service. That same month, Spin was in the process of finalizing a $125m security token. The idea with Spin’s security token offering is to raise money from accredited investors, who will then be entitled to a portion of the revenue from Spin’s electric scooter operations, according to a source close to Spin. With STOs, investors can buy tokens that are linked to real-world financial instruments. In the case of Spin’s offering, the tokens are linked to its revenue. Spin had previously raised $8m in traditional venture funding. The story was broken by Axios, but the context here is far more worthwhile. “A mercy killing”, according to one observer. Spin has been struggling for finance. Interesting move by Ford, though. After months of rumors, teasers and anticipation, Samsung has finally revealed its first folding smartphone — but there’s a catch. Shown off by CEO and president DJ Koh during the opening keynote of the annual Samsung Developer Conference in San Francisco, the Infinity Flex Display is only a prototype for now, and won’t be ready to buy until 2019. The concept comes just days after Royole announced the FlexPai, which the company claims is the world’s first smartphone to feature a folding display, and early adopters should receive in late-December. In its extended position, the FlexPai is more similar to a tablet than a smartphone. It features a 7.8-inch 1440p AMOLED display. The display itself is bright and offers saturated colors; I didn’t notice any difference in quality compared to standard AMOLED panels in traditional smartphones on the market today. As you may have noticed, the display is sized at a 4:3 aspect ratio, presumably so the device can better function like a traditional phone when folded. The folding mechanism is supported by a hinge composed of over 100 unique components. The hinge seems very sturdy, but obviously the real technical achievement comes in the form of the flexible display. In addition to the underlying flexible display panel, Royole is using a type of flexible plastic material instead of the familiar cover glass. While the plastic does not feel nearly as premium as glass, it’s probably the best material available for the task. As an added benefit, it effectively makes the FlexPai shatterproof. Taking the Royole FlexPai from tablet to phone mode is pretty straightforward. It’s just a matter of taking both sides and folding it down the middle. The hinge supports pretty much every angle, so you can fold and use it in any position you wish. Royole claims the FlexPai can be folded at least 200,000 times, which should be enough for several years of normal use. Gimmick? Or wave of the future? I’m surprised they’re not using flexible/foldable screens on smart bracelets. Rigid smartwatches are struggling with practical/aesthetics limits on both screen size and thickness, isn’t there a market for a pancake version ? That’d be outside if the norm (so “ugly” to be simplistic) but very functional. 1- it exists. Google is willing to go on the record with facts and data, which Apple and MS aren’t, preferring to rely on PR and innuendo -to great success, because as Trump as proven and as has just been explained to me here, emotions > reason and information. 2- it’s rather good, only 0.08% of PlayStore-only Androids have what’s dubbed a “Potentially Harmful App” (mostly, ad-clickers). China excluded though. That number grows tenfold for phones installing apps from outside the PlayStore, which is less impressive. 3- progress is very fast, that 0.08% was 1% only 4yrs ago. Combine this with the also underreported study from Gartner naming Android (when updated)nthe safest OS, and some undeservedly popular FUD mostlynaround potential, not actual, exploits should stop. Fat chance.